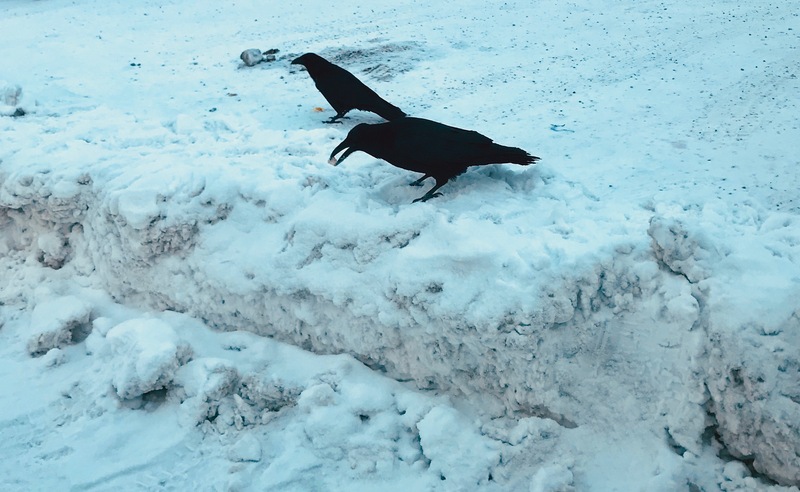 The Curator’s curiosity towards wildlife, knows no bounds, and he has more than once inquired about the difference between the American Crow and the Common Raven. A pair of Fairbanks ravens are pictured here. Ravens are larger, about the size of a red-tailed hawk, and they often travel in pairs, where crows often travel in a flock. Crows have tail feathers that are basically the same length, so when they spread their tail, it looks like a fan. Ravens have longer middle tail feathers, so theirs looks like a wedge when spread out. Crows also emit a cawing sound, while a raven gives off more of a low croak. The audio of a raven is an Alaska Field Recording, which is in the public domain. Thanks to floydstinkyboy for sharing it. Ravens are seen year-round in Fairbanks. They are incredibly smart birds. I knew a sled dog who, I was told, had to defend his meals from ravens as a puppy, and he never forgot. He grew to hate ravens, and just the sight of them flying overhead drew a raucous, angry, bark fest. The ravens seemed to know this, as they would torment him just by chatting with him calmly from the tree top near his doghouse. One of my favorite raven encounters happened in a lumber yard parking lot. I was in my truck talking to a customer on the phone, when a rather large raven landed on a truck in front of me. I watched captivated as the raven tore off the rubber from a windshield wiper. Out of the corner of my eye, I saw a man flailing his arms and running towards the truck. The raven quickened its pace, and promptly removed the rubber from the other wiper blade. Just as the man reached the truck’s hood, the raven lifted off into the air, with both rubber strips trailing behind it like a couple of thin snakes. An exasperated gentleman, proceeded to round on me for not defending his truck from the opportunistic flying thief. I had to admit to the man, that I was so mesmerized by the raven’s actions, that intervention never occurred to me. The entire time, the customer was howling in the phone, as I had been giving a play by play of the action.